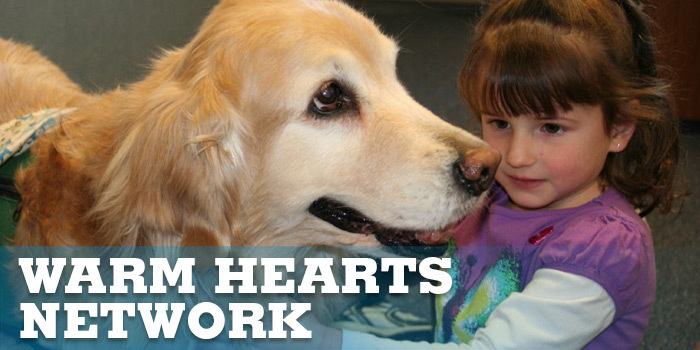 The final step required for handlers interested in becoming a Warm Hearts Network Volunteer Visiting Team with their dog. All new visiting teams must pass their team testing in order to be registered as a Warm Hearts Network team. Team testing typically requires 20 minutes for the actual test, and an additional 30 minutes for registration and paperwork following testing. Testing times will be assigned through contact with the Warm Hearts Network registrar following screening and/or Handlers’ Workshop. The test is $10.00 for a single handler team. Registration is $30 for 2 years. To make a gift in honor or memory of a loved one, please click here.